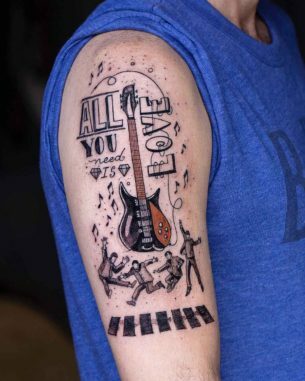 Among all the placement solutions shoulder tattoos seem to be the perfect one. Some areas are very painful others – not so much, some of them are hidden, some – constantly exposed. And shoulder is perfect from all points of view. Since the oldest times, people had always experienced the need to improve their appearances in order to underline their individuality. 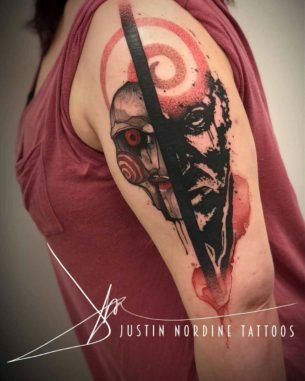 This can be achieved different ways and one of them is, obviously, – to make a tattoo. 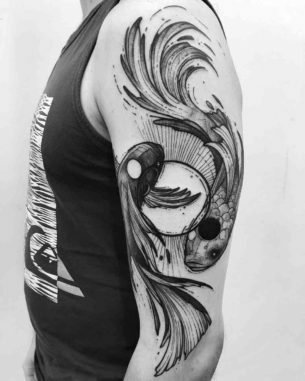 The history of tattoo art goes thousands of years back in time. 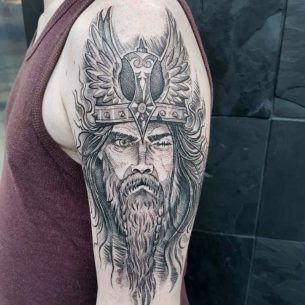 In ancient times, there were tribes, the members of which used to make tattoos on different occasions, for example, weddings, funeral, childbirth etc. Body drawings were also used as one of the ways of preparation to battles – these were images of animalistic nature, frightening masks and stuff. And pretty often these drawings were made not temporary but tattooed into the skin for the rest of their owner’s life. 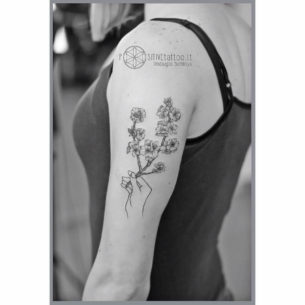 Nowadays, tattoos are popular and even became fashionable attributes, like some sort of accessories. 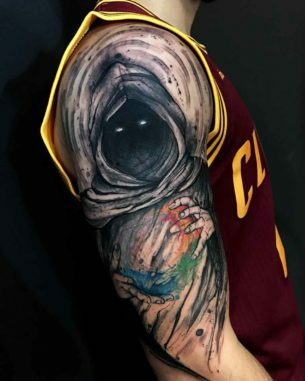 A lot of people express themselves, draw attention to their personalities with a help of permanent body drawings, or simply try to keep memories of something important encoded in lettering, symbolic designs, things that became the basis of their character, the life-changing events and experience. This desire had evolved into the separate kind of fine art with a great variety of styles, techniques and technologies. 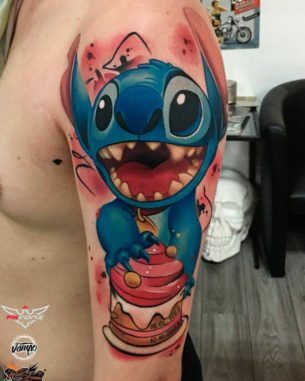 First of all, it is really easy for the tattooist to place the drawing in this spot. Also, it gives a lot of space for the artist to work on the edge of his creativity being able to create real masterpieces. 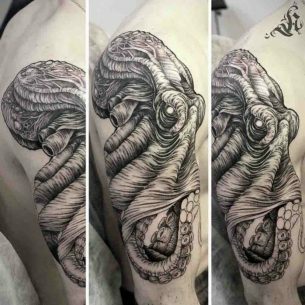 Moreover, the shape of the shoulder is rounded which gives a possibility to make three-dimensional and photorealistic tattoos. 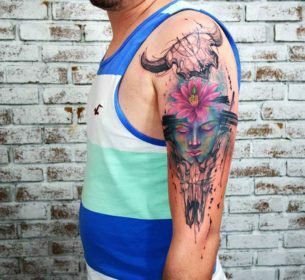 So, let’s point out a second the second advantage of shoulder tattoos, which is the lack of pain during the process of tattooing, the slight tingling – that’s what’s felt during a shoulder session. There is another thing: a shoulder is nearly always hidden under the clothes. 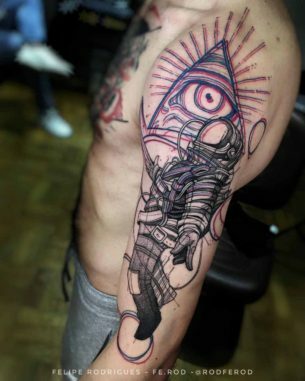 That’s why if it is not willing for you to expose your tat in some life situations, it would be easily achieved. Plus, a body drawing is protected from direct sunlight which is good. 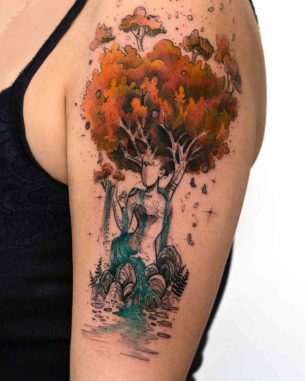 The aesthetical side of tattoos on a shoulder is remarkable with a special charm and style. It is for a reason that a lot of celebrities choose this placement. Angelina Jolie, David Beckham. 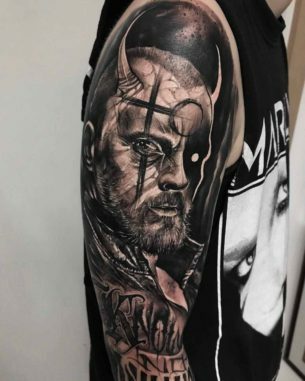 Pink, Johnny Depp, Eminem and many others have shoulder tattoos. 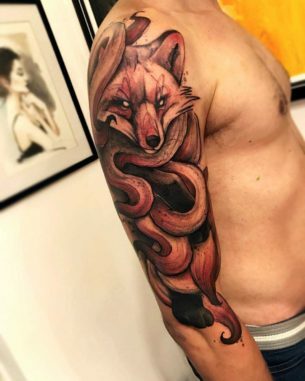 Masculine tattoos on shoulders are rather common, these are images of animals like lion, bear, tiger, dog, wolf etc. However, they also can be rather unique, for example, dragons and phoenixes. 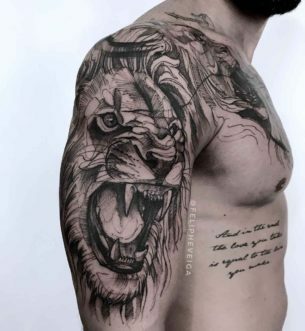 Taking into consideration that a man’s shoulder is usually muscular and big, so big designs with plot and a lot of elements can be placed there, and these drawings will look realistic due to the shape of the area. Three-dimensional abstract ideas, images of animals, birds, symbol of mystical foreign cultures, Polynesian designs, Indian feathers, ornaments etc. – all these would look awesome on shoulders. 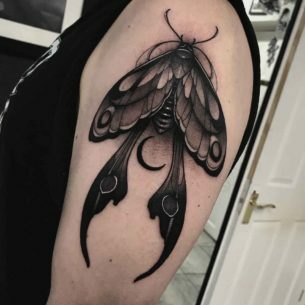 It’s obvious that any kind of a drawing can be a shoulder tattoo design, the choice depends only on your imagination and the skill and experience of the tattoo artist you are working with. 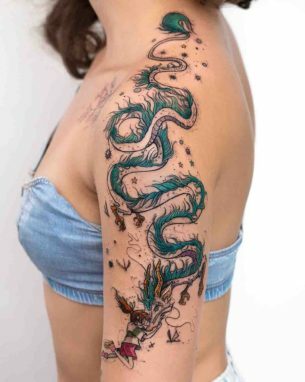 In this case, lettering ideas, ornaments, flowers, insects, small snakes, bracelet ornaments around an arm are the most popular. It also can be a date of some important event in a form of some interesting symbols. Also, splendid flowers and birds are often met. 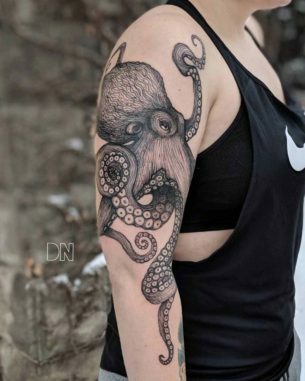 Not all women are fond of an idea to have a tattoo on their bodies. 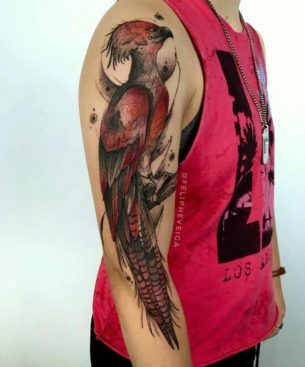 Women willing to cover their bodies with, for example, shoulder tattoos are strong, free, bright personalities. They have their inner core strength, they know their aims and goals, they are self-confident and successful in all aspects of life.